Fast forward 20 years and the print industry has been so long dead that few people actually know what goes on an invitation, let alone the basic etiquette involved. Instead of worrying that Great Aunt Martha is going to be offended by your tissue paper selection, here are seven things to consider about your wedding invitations – and they will make you proud. Choosing who to invite to your wedding very well may be the hardest decision you have to make during this process. We all have those family members that we’d really prefer didn’t come to the wedding, but at the same time, we feel required to invite them. If your venue is limited or you really don’t want to spend even more money on someone who isn’t going to make your day special, put your happiness as a couple first and tactfully find ways to invite only people you really care about to your wedding. One of the more tricky decisions for many is whether to invite coworkers. 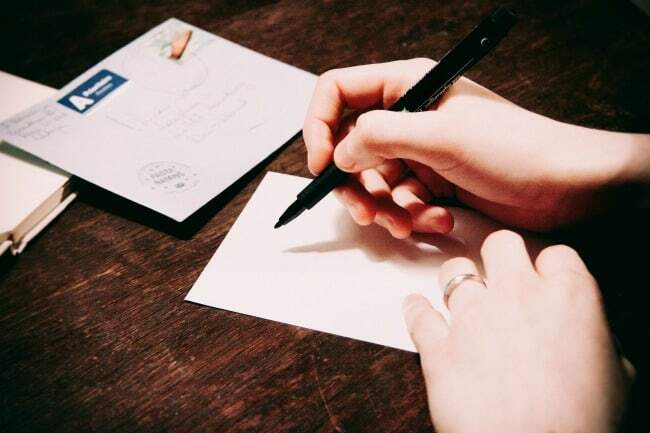 As has become the tradition, a couple usually needs at least a year to plan their wedding and the hunt for a stationer should begin almost immediately. Invitations should be mailed approximately two months before the wedding – more if it’s a destination wedding – and you should anticipate your invitations taking two to three months from order placement to be ready. Not only do you need to consider the formality of the tone you’re using in your invitations, but you also must consider who is hosting the wedding and phrase the invitation accordingly. Of course, you can always buck tradition altogether and embrace casualness, but make sure that there’s still verbiage that requires the recipient to respond. Otherwise, you might have an unexpected guest show up with no additional place settings available. Ask any graphic designer about fonts and you’ll soon learn how important choosing the right one is. The schools of thought on font choices are endless, so it’s important that you keep in mind the theme of your wedding when selecting a font. Serif or no serif, avoid overly scripted choices that are potentially more difficult to read and don’t pick a typeface that’s too cutesy if you’re aiming for a more formal affair. Perhaps more challenging than choosing a font, making a decision on paper for both your stationery and envelope can be an involved process. Depending on the shape and heft of your paper, you may be required to pay more in postage later. Again, when choosing design details such as matte vs. gloss, keep in mind your style as a couple and how you imagine that translating to your guests via these invitations. Check with couples you know that were recently married to get a recommendation for a printer near you. By reputation, printers can sometimes be difficult to work with so finding one that is reputable and thorough is crucial in making this process as painless possible. The numerous different styles of printing adds another layer to consider. Factors to keep in mind include how quick their turnaround is, samples of their work and a willingness to supply proofs and edits. Once you finally get your beautiful invitations that you’ve basically made into a work of art, you may just want to stuff them in the mailbox so your loved ones can see your masterpiece. Unfortunately, there’s one more step before the invites wind up in the hands of your family and friends: stamps. There are moments in our lives where a random assortment of stamps will do just to get mail out the door, but your wedding invitations are a time to add a bit of pizzazz. Try to find stamps that go with your theme or are particularly significant to you. As a memento, you can even save some of your stamps as a keepsake (sometimes they can also be worth a lot of money in the future). So, keep in mind these things to consider about your wedding invitations and set the perfect tone for your big day. Do you have additional wedding invitation tips or advice? Tell us in the comments section below!